Since I am back to work and have much to do after a rather long sickness and holiday, I am still trying to fit blogging to my schedule. Just in case if I don't answer to some questions and comments, please search for me at Instagram wildness, I am usually hanging there more often than I should. 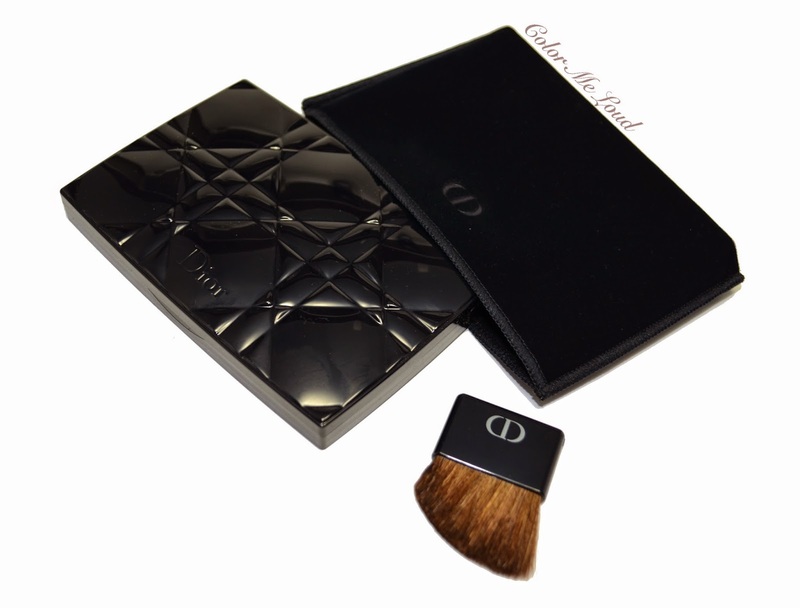 Dior Kingdom of Colors Palette comes in a luxurious sturdy plastic compact with Dior's signature cannage pattern. The lid is magnetically attracted. I am lately having problem in finding the opening point of some of the magnetic cases (MAC Mineralize I am looking at you) but this one is easy to open. Compact comes in a matching velvet pouch, which has a small pocket for the cute blush brush. The brush is angled and I believe it is made of synthetic fibers. Here is a close look at Dior Kingdom of Colors Palette. The plastic cover which separates the product from the mirror has the names of the products written on it. I have already posted some photos and swatches a few week ago. You can check them out here. Eye Liner (cream, 0.8 g): It swatches rather sheer but once applied with an eye shadow brush, it applies nicely as an eye liner. I have also tried to add a bit of this one on to the crease and it worked although it didn't bend that well for this purpose. 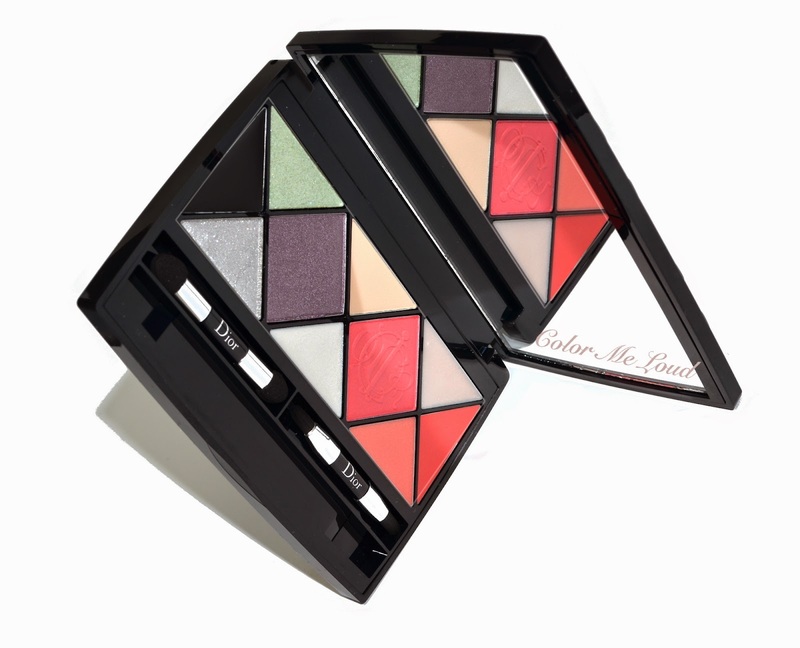 Eye Shine ( powder, 0.6 g): I think this is the most interesting product of the palette. It has a lovely multi dimensional shimmer on a transparent base. I think it is meant to be applied on other eye shadows. I have tried it over the purple eye shadow and the effect was lovely. I use my fingers to pad it onto my lid. It also didn't migrate during the day. 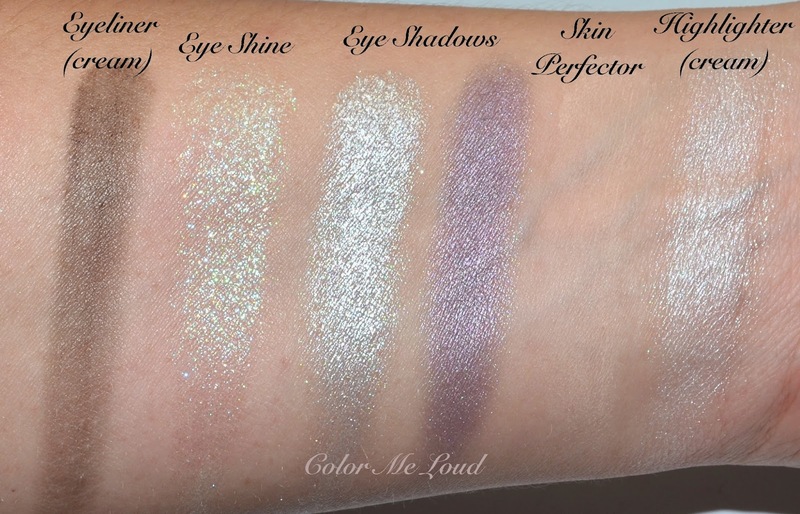 Eye Shadow (powder 1 g): The smallest pan is a very frosty silver which I can only imagine wearing on the inner corner of the eye in a very blended way or mixed with the purple eye shadow. I forgot to wear it today, which might be a good decision because very frosty eye shadows on inner corner accentuate my fine lines there. Eye Shadow (powder, 2.3 g): A mid toned purple with a nice sheen. I can see myself getting some use out of this one. I am glad that it is one of the big pans. I have used it all over the lid today and I was happy with the result, especially once combined with Eye Shine. Skin Perfector (powder, 1 g): I don't know what to do with this one. Its pan is very small for an all over application. I use it to blend the eyes shadow over the crease. Any ideas? Skin Highlighter (cream, 0.7 g): This is very shimmery on the swatches but on my face once blended it looked fine and not like a disco ball. It can really be sheered out. Here is me wearing the purple eye shadow all over with Eye Shine padded on top. I have also eye liner along the upper lash line as well as applied a little on the crease. I blended over the crease with Skin perfector. Lipstick (cream, 0.6 g): This is a tiny lipstick but the shade is really nice. It also goes so well with the provided Blush. I can't see myself taking this huge palette with me to reapply my lipstick though, so once a daytime match with cheeks. Lipglosses (cream, 0.7 g each): These must be the most disappointing product in the palette. They provide no shine nor color. The lipstick formula is already glossy so no need to add these on top. I have tried it over the lipstick today and the result could not be seen. 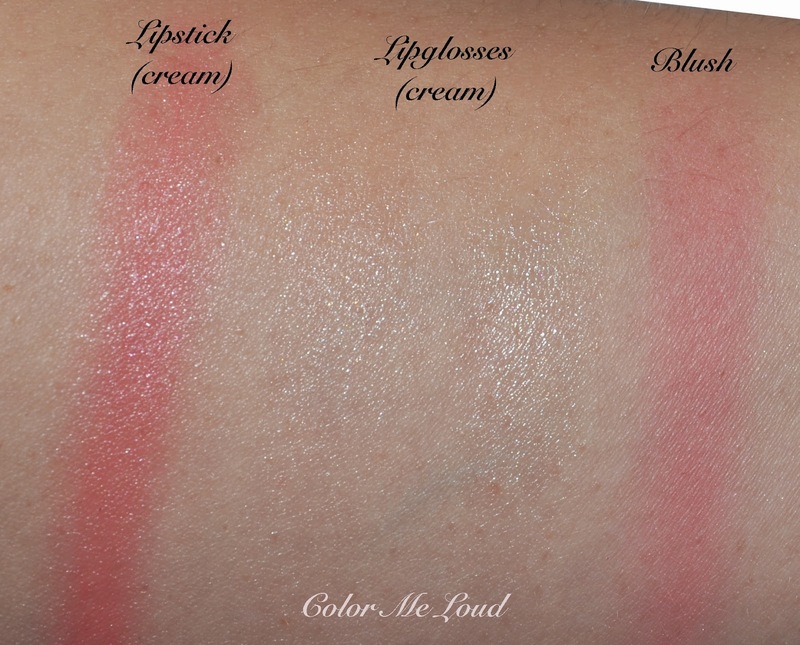 Blush (powder, 2.6 g): This is another favorite product of mine from the palette. Gorgeous shade, very pigmented and lasts all day long. I like Dior's new blush formula and this one is no exception. 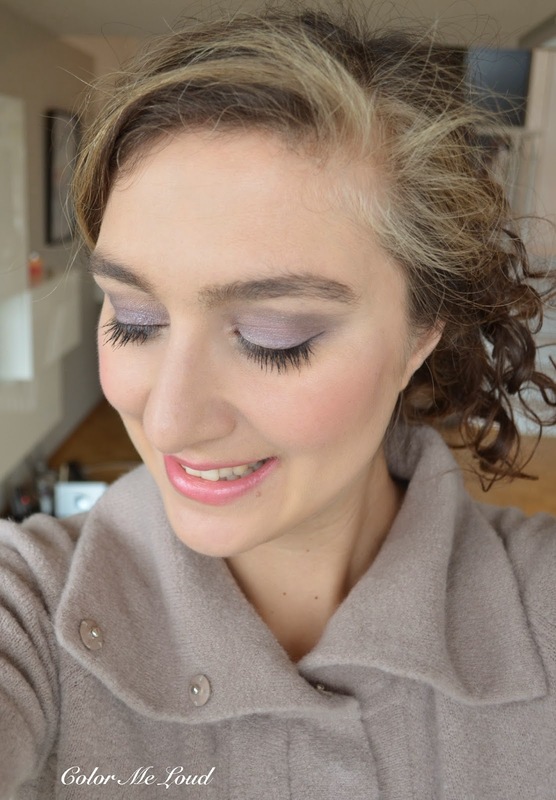 Here is my face using only Dior Kingdom of Colors Palette for Face, Eyes and Lips. I have only added Foundation, powder, concealer and a tad of sculpting powder. 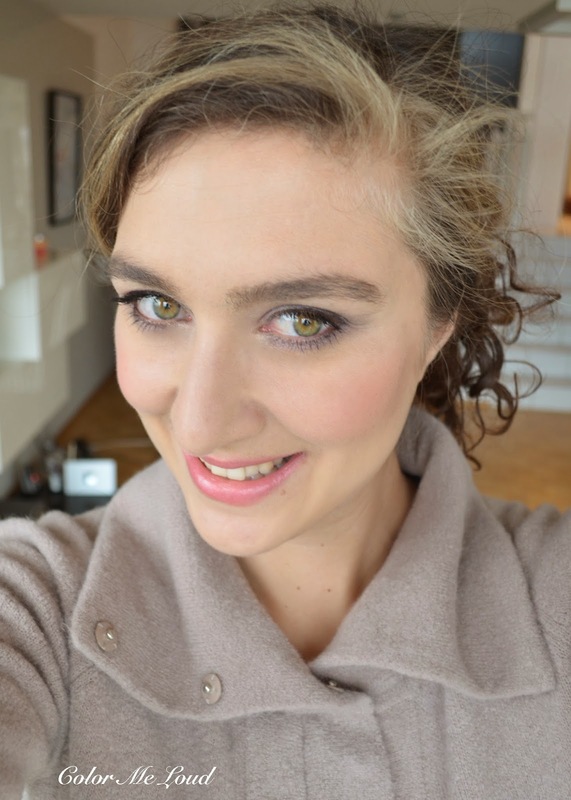 I have used the blush, lipstick combined with one of the lip glosses and skin highlighter from the palette. I like the resulting soft spring look. Final thoughts: I liked Dior Kingdom of Colors Palette for Face, Eyes and Lips more than I thought I would. But honestly at this price (over 70 € in Europe), I can't recommend getting it. For this it had to knock me off my feet but it didn't. It has to be mentioned though that the palette has a generous amount of 10.3 g product in total. Do you like palettes with one type of product (eye shadow palette or blush palette) or do you think getting different products all at once justifies the price after all? You look lovely, but then you always do. Love the sweater. sweater is from More & More, do you have that brand there? Hey Sara, this palette actually looks really good on you! I was thinking it wouldn't be much but you're right: once applied, it looks much better! I'm not sure how I feel about mixed-medium palettes. Generally I avoid them. I might have to swatch this one tho! I also generally avoid once there is a slight chance of powder touching the cream products. The consistency of these are not that creamy though, so it works in a way. I like it applied, washed there would be a darker definition shade. Yeah, I got it a bit cheaper so it was ok, I wouldn't pay 70 something eur, but I guess in the states it is anyway cheaper. You look stunning! Love the eyeshadow colors. I am thinking twice if I will give a go to this palette for its kinda pricey. Will think seriously about it eventhough its really so pretty. I hope you can find a counter to play with it before you decide. Because of the price, the decision is rather harder. I have to admit, I wasn't interested much in the color selection but wow, it totally transforms once you apply it to the face! Gorgeous look, Sara! I'm especially loving the lip color! I don't mind palettes with multiple types of products but if they have different consistency (powder, cream) then I'd like them to be completely separated from each other and preferably have a divider or a lid to cover the cream product! I know what you mean. The cream products in this palette are not that creamy though, so the powder doesn't get stick on them. I love the design of this one, but not sure about everything in there. So mixed feelings overall. yay yay, rocking that purple eyeshadow and blush Sara!!! That powder... you're gonna laugh... the BA told me to use a finger and just dab it over my face for touch-ups. I was like WHUT??? But i'm thinking, maybe 1 of those dense sponge wedges that makeup artists sometimes use to apply liquid foundations? It may be useful for touchups of the t-zone, or for setting eye primer and undereye concealer. Honestly, at that size, this is 1 powder i am quite confident of hitting pan on fairly quickly! LOL, for the face, this small pan, no way, lol. Maybe under the eyes but seriously why did they bother with it. It would be much better to have a matte deeper shade for smokey eye or something. It's 55GBP in the UK, I'm seriously considering getting it as I'm going on a three week long holiday and I think this could be perfect.